Paint a dresser in chalkboard paint so you can easily label the contents. Print out Instagram photos to label drawers. Label your measuring utensils. Especially if you're an avid baker. Print out your own labels. These pretty labels can be found here. Use chalkboard paint and ribbons to label crates. Get the tutorial here. Label your kitchen jars with these decals. Use Dry-Erase markers on plastic. It doesn't look as pretty, but it's easy. 2. Finally get that tangle of cables in order. Label the cords with bread tags. Use binder clips to keep cords from slipping off your desk into the ether. Wrap up the cords you're not using in toilet paper rolls. Store in a box. Be sure to label the compartments or else you're going to tear that box apart looking for the one obscure micro-USB cable that only goes with your Kindle and ruin your ENTIRE SYSTEM! Use a shoebox to hide unsightly cables. Get the directions here. Or store them in a shoe organizer. Hide cords behind a TV or desk with foam pipe insulation. Nail a basket under the desk as a cord catcher. 3. Now that Christmas is over, it's time to put away those cookie cutters. Store them on a paper towel holder. Wrap holiday string lights around a paper towel roll. Cut a slit in the end of the paper towel roll to keep them from unraveling. 4. Stop leaving your shoes out when you walk through the door. Keep shoes off the floor by hanging a low coat rack against the wall in your entrance area. 5. Finally get around to compartmentalizing your underwear drawer. IKEA sells little organizer boxes. Filing your clothes and keeping them divided is especially helpful if you keep your underwear, socks, and tights all in the same drawer. If you just took a holiday road trip, it's probably a mess. 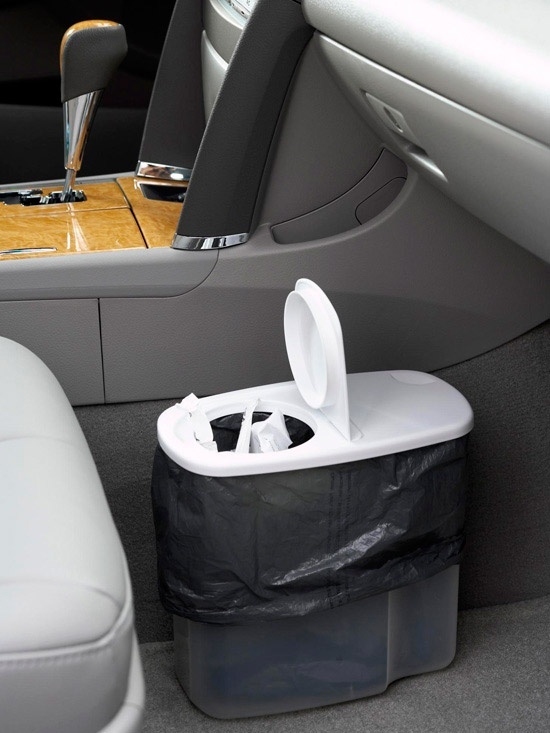 Keep your cleaning products, emergency items, and entertainment things in a shoe organizer behind the back seat. This cereal dispenser acts as a small litter bin. Access important glove compartment papers by keeping them in an accordion folder. 7. Use plastic tackle boxes to organize your first aid kit. After the natural disasters we've had this year, it's important to keep emergency items organized. You can do this with batteries, too. 8. Keep all your beauty products in one place (and label them). 9. Find a place for those loose hair ties and bobby pins. Store loose hair elastics on a shower curtain ring. Keep your bobby pins in a Tic Tac dispenser. Keep them on a paper towel holder for future arm parties. 11. Organize all your papers in binders and files. Make binders for everything. This site has printables for budgets. 12. Have a place for bills, so you remember to pay them. Get the DIY for this window shutter mail organizer here. 13. Make sure your junk drawer contains only important, meaningful items. Time to throw out anything you don't want. Use utensil trays to organize pens and pencils; use ice cube trays if you have a lot of small items. Use Altoids tins and label them. 14. Throw out the years of magazines that have piled up. File the ones you want to keep. End subscriptions of any magazines you don't read anymore, and for that matter, any pesky catalogs that keep coming. 15. Stop digging around in your purse the next time you need to find something. This particular purse organizer is $10 from eBay. As a bonus, switching purses from now on will be a breeze! Store cords in a glasses case. They'll be less likely to get tangled. Punch a hole in all of your gift and rewards cards and keep them on one key ring to save space in your wallet. 16. Clean out your closet and donate the items you haven't worn in the past year. Start this new method so that next year, this whole process will go much quicker. Vacuum pack seasonal items that you won't need for awhile. This seriously saves so much space. Be sure to LABEL them! 17. Start hanging things like tights, belts, and purses. Hang tights on a hanger. The inside of a closet door is a good place for purses. Tie shower curtain rings to a hanger and thread your scarves through them. 18. Index your closet by category. And save SO MUCH TIME getting ready in the morning. You can buy these here, or make some yourself. 19. Get rid of that shoe explosion sitting at the bottom of your closet. Simple tension rods can keep your shoes organized. 20. Make your fridge look like this. These clear plastic storage containers are from Crate and Barrel. 21. Start a filing system for your cookware. You can find these metal brackets at IKEA. They screw into the bottom of your cupboard. 22. Organize your tupperware for once. Start out by throwing away any warped containers. Store the lids in a dish rack so you can easily pull them out and access the right lid. 23. Free up an entire cabinet shelf by putting all your spices in magnetic tins. 24. Make a recycling station. These stackable bins make it easy to organize your recycling without taking up too much space. Not enough floor space? Put bins on wheels and keep them under a table or counter. 25. Repurpose your old containers. Use sparkling lemonade bottles to store vinegars and oils. A wooden palett makes a good shoe rack. Decorate and reuse your old paint cans. 26. Utilize the space on the insides of your cabinet doors. Use a magazine rack to store cutting boards. Images from bhg.com, Apartment Therapy, and Lucky Magazine.